This listing is for the Koshi Chime of you choice. We also offer the full set of 4, with OR without the optional Chimefornia Chime Stand. PLEASE NOTE: You can put Koshi Chimes outside, BUT like all wooden objects, if you do that, it is best to treat them regularly with a protective oil such as colorless Tung or Teak oil. It is best if they are not directly exposed to the rain. If you didn’t pay heed to this warning, and who already have mold, it can be cleaned with a little diluted bleach. 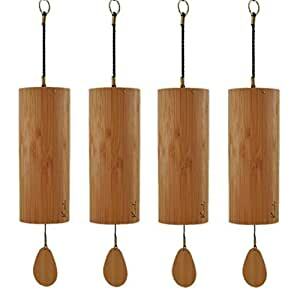 Koshi Chimes have four melodic tunings inspired by the elements. When sounding together the chimes roll in rich, harmonious overtones reminiscent of the elements’ coexistence in the sublunary sphere. Handcrafted with precision at the foot of the Pyrenees, Koshi Chimes are designed with eight notes. The notes are metal pieces welded into a plate at the base of the resonating tube. The tube itself is made of thin layers of bamboo veneer treated with natural oils. The veneer is stronger than natural bamboo and makes for a much sturdier chime, without losing the acoustic qualities bamboo is famous for.